they are not ready for downloading yet. and clicking on the game. Let's look at the critical moments in all four games. Here is a picture of Heather. this position White fell in a horrible trap winning the pawn back. White played 30.Rxh5? Rxg3+ and the Rook on h5 was lost. Heather then converted her piece up into a win without drama. Here is a picture of Carey. pressing to maintian an edge. as her moves have an air of hesitancy about them. However Carey is an experienced player who played it solid & sound. to make a blunder as soon as it got a bit hairy. Here is a picture of Amy. well to exploit this misjudgement and was cruising to a win. Three pawns adrift in the first round of an Olympiad. Resignation must have flashed through her head. simply gave a Knight away. because she just wilted away and lost another piece a few moves later. Here is the game up to the point where White blundered away a Knight. A lucky escape? Yes, but all good players have lucky wins every now and then. I wonder if Amy underestismated her opponent? I might get some feedback later. pulling a win from the fire. Here is a picture of Rhian. See the Bishop on e6? He is rather short of squares. Rhian plays a move that leaves him with no squares at all. 18.Bf6 Qd7 19.d4 and the coming pawn fork on d5 cannot be prevented. Rhian then swapped off the bits and won this pretty easily. So you could not ask for a better start. Round two report tomorrow. A good team the Norwegians outgrading the Scots Lassies on all boards. who will be having nightmares tonight about Knight forks. the Lopez. She spiced things up with 11...d5 and the game was on. 14...h6 looks wrong, especially when 14...Be7 was available (centralise). on e4 and f5. Black chops the e4 Knight but it's too late. Black is down the exchange and a couple of pawns. found a mating combination rather than pinch more material. player who is on top form. adopted the traditional method of play v an IQP. Blocked it, attacked and set about exchanging pieces. In these positions best to leave the pawns alone. You can usually hold one weakness, but two...dodgy. this was the last game to finish, a White win would have tied the match, it was lost. A Pirc. Carey has a lot of experience with this opening. One of her victims is typing this. I made the mistake of trying to blast it off the board. In this game White kept the opening space that White has from the opening and kept a grip on it. There was a chance for Black to create counter-play. Here 22...Ndc5 was worth a go instead of the 22....Re8 that Carey played. but White's active pieces set about Black's pawns. One pawn was lost and in a effort to get some activity a pawn was sacced. The extra 200 grading points, 2 pawns and flawless technique = The end. have looked at the grades and knew they were in for a tough game. Rhian still has that insubordinate bravado that comes with youth. An extra 150 points is well within her zone. Black was waiting for the 1700 player to make a blunder. Black does all the huffing and puffing but gets nowhere. Rhian does nothing rash, she keeps Black at bay and is saying. "You have the higher grade - prove it." Then Black walks herself into a sea of Knight forks. not a swindle. It was a well played game with a horrible blunder at the end. As you can see once again the girls were outgraded. This is Dougie Bryson's fault. He should fiddle it so our Olympiad girls are on the same grade as their opponents. and in this position I can see ideas. Trade off the big pawn on g2 with Bh3 is a start. I'm liking White. Instead here is where it went wrong. How do you deal with a flank attack? Heather decided to clarify the centre, with 25.d4? See that Black Knight on c6 - well it ended up on d4. This position arrived a few moves later. Black's Knight on d4 is better than White's on d5. Note White cannot create h-file threats. 32.Rh3? Qxh3! and Nf3+. Black brought the g8 Knight to h6-g4 and the game was settled. good chances in this game. I bet her opponent was glad to see 25.d4? with her Rooks and suddenly she lost the exchange. White relaxed - game won. But Rosie picked up a pawn and had a beautiful Knight on e4. White was perhaps expecting it to be easy but suddenly there was no way in. In this position Rosie took the draw with Nc3-Rd2-Nd4-Rd1-Nc3. get some activity. A draw looks fair. I'm giving the full game so here are a few comments. A London System with Black obtaining an equal position after 6 moves. 4.Bb5+ must be wrong, surely this Bishop belongs on d3. If it's theory then burn the book. 4.exd4 is OK. It then looks like an exchange Caro Khan. giving up two pieces for a Rook and pawn. In theory an even exchange. In this situation most would prefer the two pieces. Black advanced her central pawns. a sac on h3 and it was all over. Here is the game. It's actually well played by the Vietnamese girl. Carey will need some lifting after this one (I'm not helping much am I?). forget she in playing for country and put her Wandering Dragons hat on. I'm sure she would never have played 4.Bb4+ against a 1600 in a league game. The Bishop moves to a protected base, the Knight is b6. I hate Knights on b6. This was not the cause for the loss. But the loss of tempo did not help. White was playing Re1 and Rc1. The Bishop was placed on an unprotected square. The major mistake was taking the Knight on g6 with the f-pawn. That Bishop that chased to a safe place suddenly smiled. Hmmmm. Four games and not a shot at goal and that includes the draw. whose names you cannot pronounce. Get out there and have some fun. out come the girls. 4-0. This is more like it. Some wee glitches have appeared on the main site. The farce of the pairings will be reported by Keith. What is the point of both of us reporting on it? copying them down by hand and then feeding them into a database. Which means I get to go over all these games twice!! Hooray. (each one is slowly sucking out my will to live). There is also something wrong with the pictures. the site cannot find a picture so it throws up this guy. Canada to Hong Kong. (is Hong Kong playing?...Ed)...No. OK enough of this stuff let us have a look at the games. I looked at this at this game on or around move 16. White leaves her e-pawn hanging and I cannot see why Black cannot take it. OK the Bishop is pinned to the Queen but Ne2 is answered by the Queen check on g5. getting the Queens off. 27...f6 was just plain bad. A lovely game by Rosie this one. White treated herself to an IQP. Rosie played simple direct no farting about chess. What do you v an IQP? Swap the pieces leaving enough to attack and win it. Between moves 10 and 20 Rosie swaps off 10 pieces. carries out the perfect IQP plan. The IQP falls. Off comes the Queens. The ending is a breeze. form a plan and execute it without deviation. Give them Shaughnessy v Guilian, Dresden 2008.
not play 1.c4 and Pirc it as White - it's what McNab does. This time Carey was flexible of thought and used the QB to effect. on the h2-b8 diagonal. This game has it. a pawn but declined it. Carey was going to do it without a shred of counter-play. and Carey wrapped it up with a mate. they were under 1400 Edinburgh league players. That's the attitude. If any of them were any good they would be playing for Russia. Get out there and whack em. I predicted 3½ - ½ on the noticeboard. opponent made a terrible miscaculation. White to play. Passed pawns must be pushed. 49.g4 and both players Queen. Rhian Queens first and picks up the e-pawn. But Black has Qg3+ and picks up the Black pawn - draw. It's alright I've not jinxed her, I know the rules. (After typing this I have to go out and strangle a black cat). some White's to get her confidence up and then we will more of these. fresh from her fine game yesterday, sat in the 'hot' seat. Leite adopted a K.I.A. against Rosie's French. Rosie did the right thing v the KIA, namely attack on the Q-side. The critical moment came on move 22 Black to play. I think 22...Nxf4 or 22...c4 are the moves. Instead Rosie saw something and played 22...Kh8. wastes a tempo to defend who usually losses. Five moves later the Black King was back on g8 and the game was over. Black gave up the exchange to halt the White attack but it was futile. 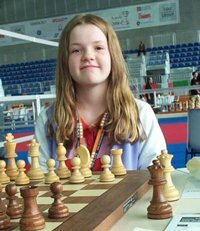 Carey Wilman was White did NOT play her Queen's Bishop to f4!! stopped, all the players stood up and applauded. Carey, wiping away a small tear acknowledged the cheers with a cute curtsy. A moving story and perfectly untrue. This game was a Pirc with White developing the Queen's Knight on d2 and a pawn c3. finding some good probbing moves and some nice squares for her pieces. Then this happened. White to play. Carey played the exchange sac 28.Rxc5!? A very interesting move. If Carey does nothing then she is going to get squished. Timing is important. Weaker players wait until it's far to late. Carey has decided it's time to get this game unbalanced. this is not go to be so easy. she will have some fun and if she goes down, then she will go down screaming and kicking. Carey has been reading Street Fighting Chess. Is it sound? Who cares? trick Black into a perpetual. Black too is a fighter. She offers the exchange back but Carey says "No". h-pawn. This time the exchange sac cannot be refused. Meanwhile Carey's d-pawn cost Black a Bishop. And then it happened. Black to play (obviously, she's in check). 51...Ke6?? to hold the e-pawn, but 52.Nf8+ 1-0.
a draw looking likely but White will have to fight for it. A lucky win? Hmmmmm.... No. Fortune favours the brave (28,Rxc5). Rhian Hughes, Steve Mannion (trainer/coach/manager) & Rosemary Guilian. being out of practise and her Sicilian is taking a battering. She comes out fighting but it's all too much too soon. It looks like one my games. Alas White's set-up v the Sicilian (0-0 and f3) is solid. 'come on let's fight' type moves. and played simple solid chess. When White was fully developed and with her King tucked away on hi. invaded on d6 and it was all over. There were far too many targets for Black to cover. This was the last to finish Rhian needing to win to draw the match. She picked up a pawn with some deft play then entered a minor piece ending. Rhian was lucky here. Black to play. Black played 52...Nxd4+ but 52...Kc7 wins the Bishop. that annoying-pawn. This is a draw. So I did jinx Rhian after all. (I could not find a black cat).